Before releasing the parking brake, move the shift lever to P for safety. When the parking brake is applied or the brake fluid level is low, the brake warning light comes on. (b) When the ignition switch is turned to ON, check that the ABS warning, brake warning, TRAC OFF indicator, VSC OFF indicator and slip indicator lights all come on for approximately 3 seconds. If the skid control ECU stores any DTCs, the ABS warning and slip indicator lights will come on. 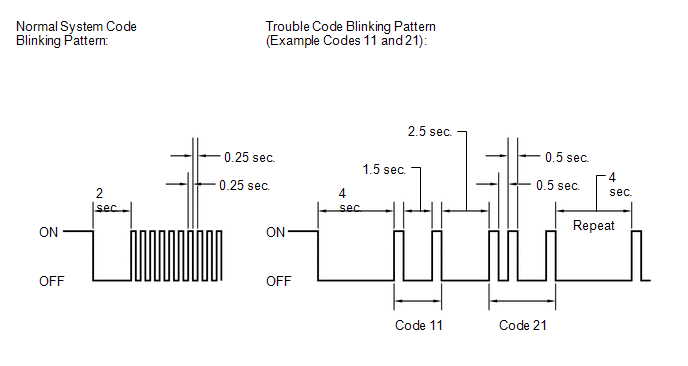 If any of the indicators remains on or does not come on, proceed to troubleshooting for the light circuits listed below. DTCs are stored if any malfunctions are detected during each sensor check. (2) Check that the steering wheel is centered. (3) Check that the shift lever is in P.
(4) Connect the Techstream to the DLC3. (5) Turn the ignition switch to ON. (6) Turn the Techstream on. (7) Switch the skid control ECU to Test Mode using the Techstream. Enter the following menus: Chassis / ABS/VSC/TRAC / Utility / Signal Check. (8) Check that the ABS warning and slip indicator lights come on for several seconds and then blink in Test Mode. The TRAC OFF indicator light remains on during Test Mode because TRAC is prohibited. (9) Check the ABS sensors. 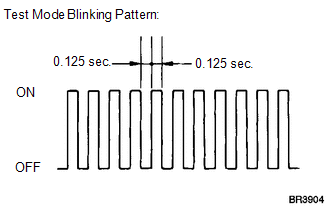 Check that the ABS warning light is blinking in the Test Mode blinking pattern before performing the ABS sensor check. Perform the check in the lost booster pressure state (negative pressure in the booster is depressurized). (3) Start the engine while depressing the brake pedal with a force of 65.5 N (6.7 kgf, 15.0 lbf) or more for 1 second or more. If the lost booster pressure judgment check is not completed normally, the master cylinder pressure sensor check is not judged. If a recheck is performed after the engine has started, end the Test Mode, enter Test Mode again, and release the vacuum in the booster by pumping the brake pedal prior to the recheck. If the lost booster pressure state is not judged to be normal, the brake warning light comes on and Test Mode DTC C1281 (Master Cylinder Pressure Sensor Output Malfunction) is recorded. (1) Drive the vehicle straight-ahead. Accelerate the vehicle to a speed of 45 km/h (28 mph) or more for several seconds. (2) Check that the ABS warning light goes off. The sensor check may not be completed if wheel spin occurs. The ABS warning light goes off when the sensor check has been completed. The speed sensor check may not be completed if the speed sensor check is started while turning the steering wheel or spinning the wheels. If the sensor check has not been completed, the ABS warning light will blink while driving and the ABS system will not operate. After the ABS warning light goes off, if the vehicle speed exceeds 80 km/h (50 mph), a sensor check code will be stored again. Decelerate or stop the vehicle before the speed reaches 80 km/h (50 mph). When the sensor check has been completed, the ABS warning light goes off while driving and blinks in the Test Mode pattern while stationary. (1) Check that the TRAC OFF indicator light comes on and VSC OFF indicator light goes off. (2) Press the VSC OFF switch. (3) Check that the TRAC OFF indicator light goes off. (4) Press and hold the VSC OFF switch for 3 seconds or more. (5) Check that the TRAC OFF indicator and VSC OFF indicator lights come on. (1) If the sensor check is completed, the ABS warning light blinks (Test Mode) when the vehicle stops and the ABS warning light is off while the vehicle is driving. (1) Read the DTC(s) by following the Techstream screen. If only DTCs other than Test Mode sensor check DTCs are displayed, repair the malfunctions and clear the DTCs. If Test Mode sensor check DTCs and other DTCs are displayed or if only Test Mode sensor check DTCs are displayed, repair the malfunctions, clear the DTCs, and perform Test Mode inspection again. (2) Turn the ignition switch off and disconnect the Techstream. 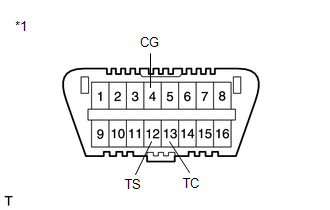 The codes in this table are output only in Test Mode (signal check). (4) Using SST, connect terminals TS and CG of the DLC3. (6) Check that the ABS warning and slip indicator lights come on for several seconds and then blink in Test Mode. (7) Check the ABS sensors. If the lost booster pressure state is not judged to be normal, the brake warning light comes on and Test Mode DTC 81 (Master Cylinder Pressure Sensor Output Malfunction) is recorded. (2) Count the number of blinks of the ABS warning and slip indicator lights. If more than 1 malfunction is detected at the same time, the lowest numbered code will be displayed first. (3) After performing the check, disconnect SST from terminals TS and CG, and TC and CG of the DLC3, and turn the ignition switch off. (4) Turn the ignition switch to ON to cancel the Test Mode. If the ignition switch is not turned to ON after SST is removed from the DLC3, the previous Test Mode will continue. 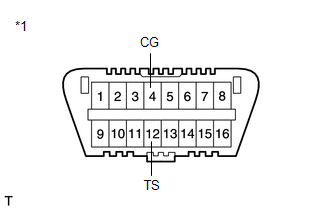 If the ignition switch is turned to ON with terminals TS and CG shorted, the previous Test Mode will continue.